Starbucks is considering adding Angry Birds high score tables to its outlets, turning your local coffee shop into some kind of horrifying bird-chucking Thunderdome. According to the Guardian, the ubiquitous caffeine-pimping chain is in talks with Angry Birds developer Rovio regarding the addition of the electronic leaderboards. Leadboards they're hoping will drag in competitive gamers as well as traditional sugary coffee addicts. The idea seems like a modern take on the arcades of yore. Players who clock up high scores while playing Angry Birds in a Starbucks store (or "around a Starbucks store" considering the chain's lax WiFi security) will earn a place on the electronic leaderboard. A position that will demand the respect and admiration of their fellow Angry Birds fanatics. At least until someone comes along and outperforms them, that is. While the potential for competitive gaming, even on a very casual level, in a popular chain store is exciting, the potential for entertaining fisticuffs involving scalding hot beverages is even more so. Rovio has already tested the scheme in outlets of US book retailer Barnes and Noble, and apparently it was quite the success. Nearly 10,000 people spent more than half an hour each playing Angry Birds - presumably instead of buying books. Considering Starbucks' clientele, their well known fondness for iDevices and how compelling the aroma of a caramel macchiato can be, that half hour could be used to shift a lot of drinks. 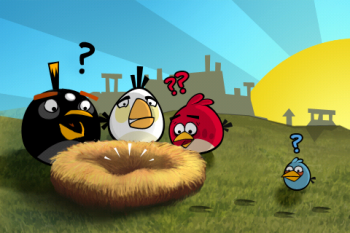 "It's tying in the real world with the virtual world," said Rovio's Wibe Wagemans. "Retailers get new customers who've not been to their stores yet, and repeat customers." Starbucks has made no official announcements regarding Rovio or Angry Birds as of yet.